'Anastasia'. Photo by Joan Marcus. 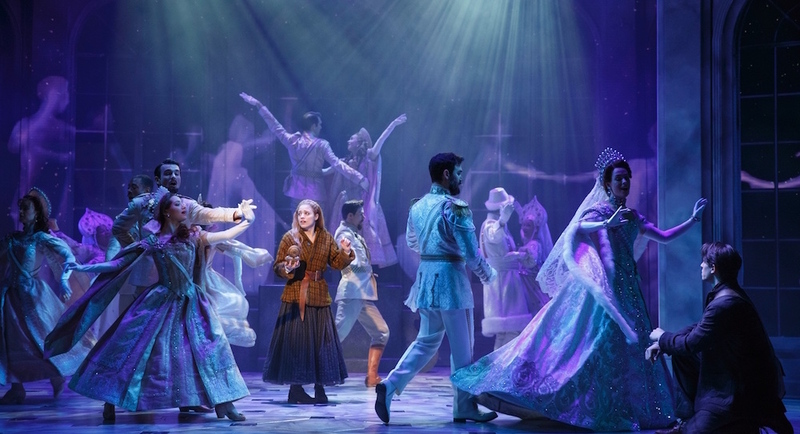 Summer is almost over (yes, really), and with the change of seasons is welcoming a host of new Broadway projects and productions. And what’s most exciting to us is all of the amazing dancing that is set to hit the Great White Way! Here’s a list of what’s to come on stage and screen this fall. A new FX miniseries will feature the relationship of director/choreographer Bob Fosse and his wife and muse, Gwen Verdon. The series will star Sam Rockwell and Michelle Williams and the creative team includes Hamilton’s Lin-Manuel Miranda (producer), Tommy Kail (director), Andy Blankenbuehler (choreographer), and Dear Evan Hansen’s Steven Levenson (book writer). Fosse and Verdon’s daughter and artistic director of The Verdon Fosse Legacy LLC, Nicole Fosse, will also serve as co-producer. Taylor Swift, Jennifer Hudson, James Corden and Ian McKellen are the first celebrities so far set to star in an upcoming film adaptation of Cats. Filming is set to begin in the U.K. in November. The movie will feature dancing by Olivier Award-winning The Royal Ballet choreographer Wayne McGregor. West Side Story was announced to come back to Broadway for its fifth revival. The production will open just after the Spielberg movie will hit theaters. This revival is different, however, with new choreography by Teresa De Keersmaeker and direction by Ivo van Hove. This is the first revival of West Side Story to radically deviate from the original Jerome Robbins production. 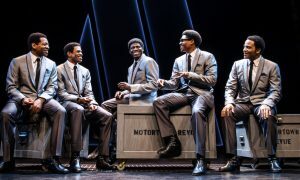 Ain’t Too Proud: The Life and Times of The Temptations is set to open at Broadway’s Imperial Theatre this spring. 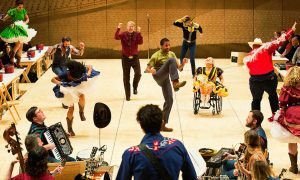 The jukebox musical, which received rave reviews in Berkeley, is choreographed by Sergio Trujillo (Summer, Jersey Boys, Memphis). 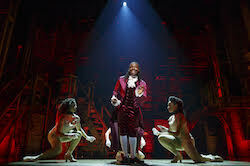 ‘Hamilton’. Photo courtesy of Chloe Campbell. Rumor has it that Hamilton might make its way to the big screen! Hollywood studios are currently bidding for the rights to the smash Broadway show. The movie won’t be a filmed adaptation but instead a recording of a 2016 performance with the original cast, including Lin-Manuel Miranda in the title role. All we can do is cross our fingers and wait a few years for the Broadway musical to hit theaters. 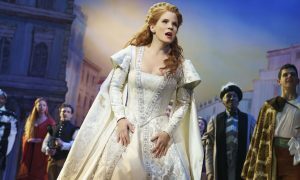 Upcoming national tours include Anastasia (October 9), Bat Out of Hell (October 16), A Bronx Tale (October 14), Cats (January 22), Charlie and the Chocolate Factory (September 21), A Charlie Brown Christmas (November), A Christmas Story (November 19), Come From Away (September 25), Dr. Seuss’ How the Grinch Stole Christmas! (November 11), Elf (November 7), Evita (January 12), Falsettos (February 8), Fiddler on the Roof (October 17), Finding Neverland (September 28), Hello, Dolly! (September 25), The King and I (November 9), Legally Blonde: The Musical (January 22), Miss Saigon (September 21), Monty Python’s Spamalot (October 19), Rock of Ages (October 13), Something Rotten! (September 19), Sweat (September 27) and White Christmas (November). Check out Playbill.com for more information and to find out when all of these amazing shows will be visiting a city near you.